Aluminum Spiral Stair FAA all welded construction. Arc pattern spiral staircase steps and landing. Landing has been extended to allow the center of the stair to move away from a line of sight under the balcony. Landing matches the spiral stairway step design. Code compliant balusters, all 3/4" square, spaced less than 4" apart. Handrail #210 not seen on many spiral stairs made of aluminum has a nice feel and blends with this backyard feel. 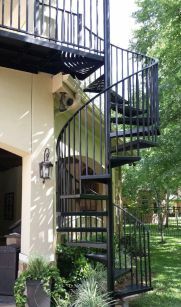 Stairways, Inc. all welded aluminum spiral stairs are not only great for beach environments but any exterior setting. Standard finish is mill unfinished. As seen in this photo, finish has been primed and wet painted black. Mill finish on aluminum spiral stairs, either welded or bolted kits, are fine in exterior applications. If a color is desired, either wet paints or powder coatings can be applied to accent surroundings.